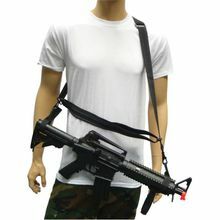 This three point sling comes with multiple straps to customize the fit for your weapon. Designed to work with fixed or collapsible stocks. The design allows the shooter to drop the weapon for other tasks without the fear of dropping or damaging the weapon, while still being easily accessible when necessary. Strap is made of ballistic nylon and 1.5 inches wide. Weighs 7 oz.